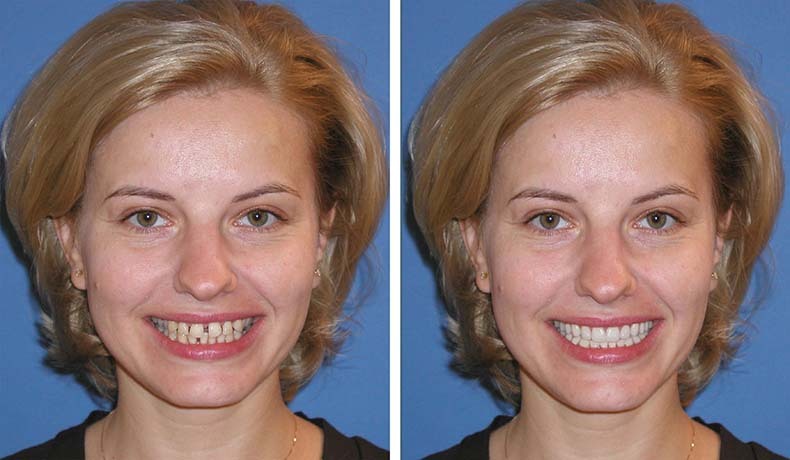 Figures 1 & 2 – Pre-op photos before orthodontics. My father who has been practicing dentistry for 60 years had a saying he shared with me early in my dental career: “To have satisfaction with your profession you need to get paid twice”. At the time, I didn’t really understand what he meant by the second pay. I realized he meant you needed to get paid monetarily but at the time I didn’t grasp what the second pay was. But as my career in dentistry slowly matured, it dawned on me the second pay was actually the most important pay. It was the job satisfaction of knowing you created a “world class” dental restoration for the patient plus knowing they were really happy with what you had done for them. For example, early in my esthetic dentistry journey I remember completing upper anterior restorations for a patient that I spent countless hours on. At the end of the appointment I handed them the mirror and to my dismay I saw the look of disappointment. It was a crushing feeling that all my hard work wasn’t appreciated by them. Then I found myself in the position to explain why I designed the restorations the way I did. At the end it only sounded like excuses and I lost the battle. I had no choice but to offer to start over (for free of course). And even though I was offering to re-do the work neither one of us left that day feeling good. Resulting in disappointment verses what should have been a great celebration. And the second pay my father was talking about definitely didn’t happen. Fortunately, I have slowly come a long way in this journey of esthetic dentistry. I have learned that anterior dentistry, cosmetic dentistry or esthetic dentistry doesn’t have to be so stressful and unpredictable. In this article I will walk you through a case example in which you will learn a systematic approach to predictable outcomes. There will be seven key steps where you will be involved with designing the esthetics and function of the case. Four of the steps the patient will have the opportunity to give input and approve the look of the case. So at the delivery appointment when handed a mirror your patient will say “That looks great! That is exactly what I expected”. And you will probably get a hug too. 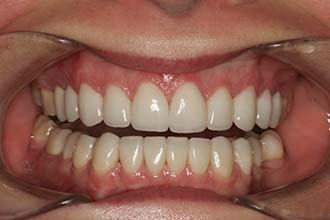 It’s results like this that really makes esthetic dentistry fun and amazingly rewarding. Figures 3 & 4 First digital before and after smile design. 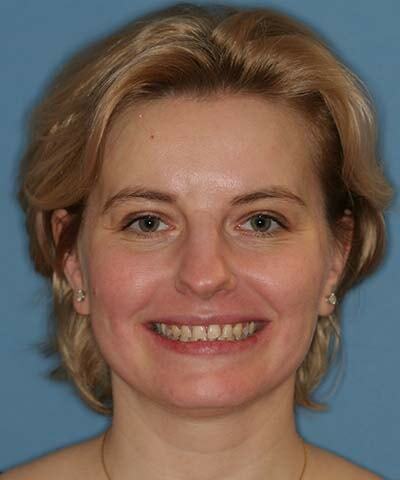 The patient featured in this article had expectations to have healthy, clean and natural looking teeth with no spaces and to achieve this with conservative restorative dental care. When you take the facebow transfer make sure you level the facebow to the horizontal axis of their face. The horizontal bite stick will be your backup to verify the models were mounted to the horizontal axis. If the patient has a canted occlusion you will be able to visualize this with properly mounted models. In Figs 1 and 2 you will see she is slightly lower on her left side. 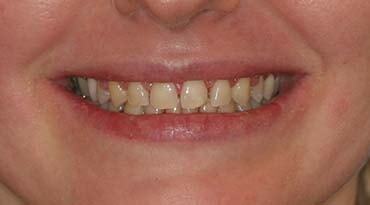 To achieve the desired results the treatment plan involved starting first with orthodontics. In most esthetic or complex restorative care, orthodontics is usually recommended. In this patient’s case she had large spaces with teeth a little smaller than her ideal proportion, deep overbite with lower anteriors biting into her palate and her buccal corridor was collapsed on her left and right (figs. 1,2 and 18). If the teeth were restored in their current position a full mouth reconstruction with full crowns would have to be treatment planned vs conservative veneers and onlays on less teeth. Since the patient requested a conservative approach, an option presenting a lower risk of tooth morbidity and periodontal issues and a lower cost would be well received. Figures 5 & 6 — Pre-op photos after orthodontics: Note the improved space distribution, overbite, buccal corridor development and axial inclination of the incisors. 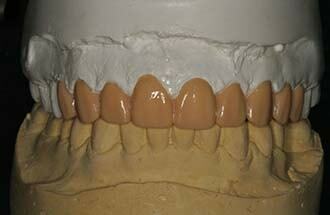 •	Create the proper spacing for the veneers. •	Bring out the left and right buccal corridor. •	Level the occlusion and correct the deep overbite. •	Improve the axial inclination of her teeth. Figures 7 & 8 — Second digital before and after smile design. This is the third of seven steps in designing the esthetics and function of the case. This is the second opportunity to get patient input and approval. To me this is the most important patient communication step. You need to translate your treatment plan and smile design into an after image that you can show the patient at the upcoming consultation appointment. There are several options one can use to accomplish this. This can be done by you or a team member in your office by utilizing Photoshop or a variety of different software programs. Or it can be done the way I do it which is by sending the before 1:10 full face photo (fig 1) along with a very detailed description of the end result to Smile Art Communications (Tony Smith). I have been doing this for 10 years now and for me it is the central communication tool I use with my patients in discussing their end results. I keep the consultation as simple as possible. I generally only use the digital image as my visual aide (figs 13 and 14). I keep the radiographs and models off to the side. I don’t want to take the patient to dental school I just want to show them how they will look. If they do not like the outcome of the final image and I can’t see a way to accomplish what they are looking for I have found out before I started anything irreversible that I will not be able to meet their expectations. To me this part alone is worth gold. If they are excited about the final image (usually this will be the case if you did a thorough new patient interview) you will know you can meet their expectations. To give you a little latitude I ask them: “If I come within 90% of what you see here will you be thrilled?” If they can’t say yes, continue finding out what they would like to see. The bottom line is you don’t move forward until they approve what they see. Sometimes this can take an additional image or two until they say “yes”. After they approve the digital image we review the treatment plan that relates to that image. In this case both treatment plans were presented and the more conservative treatment plan stated above was accepted. Once the treatment plan is approved the diagnostic wax-up is the next step. This is now your fourth part in designing the esthetics and function of the case. I will sometimes show the patient this step if I feel I need to get their continued approval. In this case we began her orthodontic treatment next. Once the orthodontic treatment was completed new models were taken, new final digital image created and approved and then the diagnostic wax-up was made. When the diagnostic wax-up was fabricated the patient approved digital image and all smile design notes were followed to the letter (figs 14,15,16 and 17). image the patient approved to the final result. Early on during the preparation phase make a trial provisional. 6 This will help you make accurate and conservative depth cuts so you don’t over or under prepare the teeth. Going back to the new patient interview, conservative tooth preparation was a priority for the patient. In figures 9 and 10 you will see the completed shade A-1 upper provisionals. We based this decision off the approved digital image. As you can see this gives you another detail that can be approved before you go to the final restorations. Figure 13 — The initial before and after digital image template shown to the patient at the first consultation appointment. 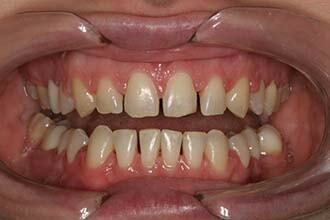 Sometimes you may see a cant to the occlusion and this is the perfect time to adjust it accordingly. Then finally give the patient the mirror and listen to what they have to say. This is the patient’s fourth opportunity to give you input and approval of what they see (figs 9 and 10). This is a great moment since you don’t have a lot of emotional attachment to the plastic provisionals and therefore it is easy to modify them if needed. If you have followed all the previous steps this step can most of the time be very straight forward. Once the design is approved the final discussion is shade, surface texture and incisal characterization. Shade is always a big part of patient satisfaction and to facilitate that you made the temporaries “in the zone of the whiteness” they approved in the digital image. During the approval discussion I ask: “Is the shade you see “in the zone” of what you would like to see or would you like them lighter or darker”. Then review the options with shade tabs until they approve the final shade. Take photos of the shade selection to document the choice. This may come in handy at the delivery of the final restorations since people will forget what they chose. With surface texture and incisal characterization show actual pictures of different cases and explain the different options. Keep it simple. If you don’t have photos to show, refer back to the approved digital image (figs 7,8 and 14). Once everything has been agreed upon, document the results! Get the following: AACD photo series, model of the provisionals, facebow transfer, horizontal bite stick and photos of the shade tabs next to the teeth. Figure 15 — Pre-op study models used to design the diagnostic wax-up for the restorative phase. Figure 16 — Diagnostic wax-up of the lower restorations for approved results. 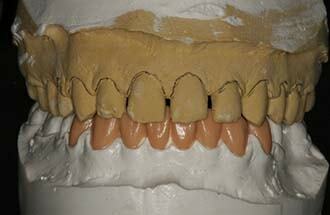 Figure 17 — Diagnostic wax-up of the upper dental restorations once the lowers were completed. 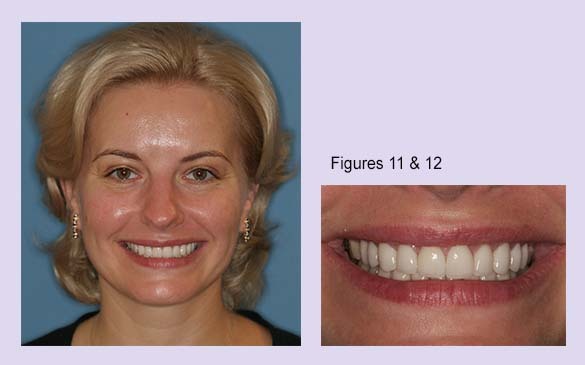 Figure 18 — Pre-op photos before orthodontics. 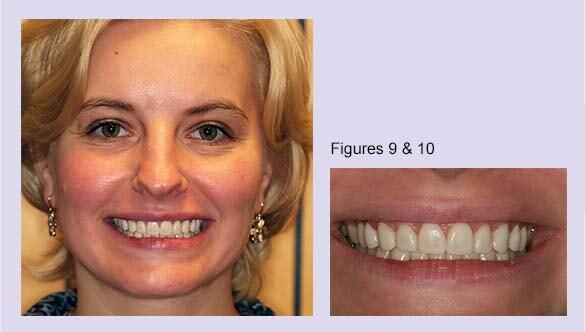 Figure 19 — Pre-op photos after orthodontics show improvements. Figure 20 — Final photos at the one week follow up visit. This is your sixth opportunity to fine tune the esthetics and function of the case. You get the input of your talented ceramist to really dial in the details. Don’t make any major changes at this point but he or she should help you with the little details that can really make the case become what the patient discussed in the new patient interview. When the case is completed make sure it is back in your hands well before the try-in date. This gives you a chance to verify all the parameters that you and the patient want to see. Some of the basics are: final shade, length, width and contours of the restorations, no midline cants, no occlusal cants and proper emergency at the gingival margin. If any of these are not as you would like to see then recontour them yourself. If it is something you can’t do then send it back to the ceramist to make the needed changes. You want to go into the try-in appointment knowing that you have gotten the case set-up perfectly. The patient will sense your confidence and will more likely also be confident with the end result. This is now the seventh opportunity to verify the esthetics. 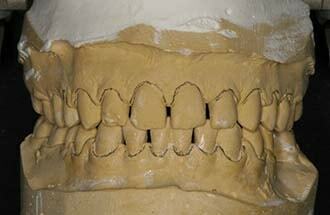 And the patient’s fifth time to approve their new smile design. If you followed all the previous steps discussed this appointment should be stress-free and a lot of fun. You have handled all the details in getting the patient’s feedback and approval throughout the process. You also are exuding confidence since you know in your heart there should be no surprises. Although, emphasize this is a try-in appointment only and if everything looks great to both of you then they will get them bonded in that day. This takes pressure off of you to not disappoint the patient and actually makes you look great if you do finish the case that day. It’s an opportunity to under promise and over deliver. Once you have tried everything in and have determined you are happy with the results now give the patient the mirror and watch their eyes. This is the moment where you get a pit in your stomach or everyone is feeling really great. It’s the patient’s last approval opportunity and should only be a formality. To help confirm the shade I show them the photos of the provisionals with the shade tab and then I show them the same shade tab next their new restorations with try-in paste. 8 Since they most likely have already forgotten how the shade looked this will refresh their memory to what they had selected. Once you have concluded everyone is happy you are ready to bond in the case. This is now just a formality. You will have confidence that everyone is going to be thrilled with the results. You may want to do slight artistic adjustments but don’t change anything the patient will notice. This is where sometimes we can shoot ourselves in the foot. For example, creating little mamelons that look really good to you but now the patient may perceive them as” bumps” in their teeth. Remember the new patient interview and follow their likes and dislikes. I have messed up my share of cases by creating an additional custom look and the patient rejected what I had done. This part of the appointment is my favorite. We seat the patient up and give them a mirror one last time. You and your assistant are looking at the same time while the patient is admiring the end result of our dental work. Your first comment is stating how fantastic they look and you are thrilled how it turned out. Your patient will feel the same way. Sometimes you may even get a hug. On the way out get the rest of your team involved. This positive energy should be shared with everyone. They all work hard every day and these special moments need to be shared and celebrated. Have the patient back one week later to verify the occlusion, check for excess resin and make sure the patient is happy. This should be routine but occasionally there might be a little detail that needs attention. 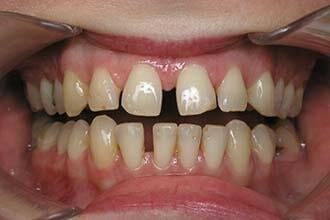 This appointment generally involves a slight equilibration and a post treatment consultation. Review where they came from, review maintenance instructions and once again celebrate the results. This is when I will ask for a referral of a friend or family member. Finish with a final AACD photo series3 and set up a future follow-up visit (figs 11,12 and 20). 1. New Patient Interview: patient’s input your detailed notes and your initial thoughts on how this case should look. By the time you get to the final restorations the patient has given you four opportunities to guide you on what they want for a final result. This is why you will find the final visit to be so predictable and now enjoyable and rewarding. 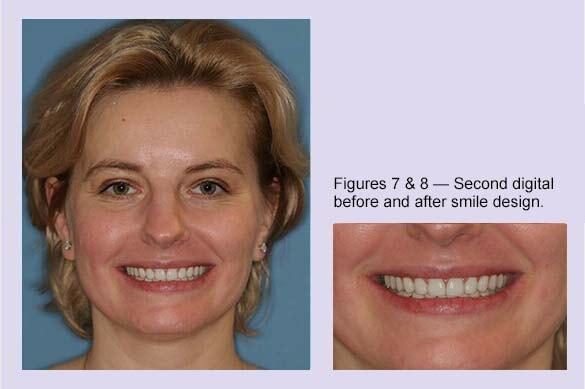 Following the photos you will be able to see how the initial approved smile design was followed throughout the treatment. And as a result, a fairly complex case had become a straightforward sequence of steps that lead to an end result where the patient said: “That looks great! That is exactly what I expected”. Fortunately, I now understand what my father meant by the second pay. And as a result, I have enjoyed what this profession has given me. But I also have felt through all the benefits beautiful esthetic dentistry gives our patients I get to hear every week about how they feel my work has increased their self-confidence and self-esteem. They tell me stories on how they have seen their relationships and success in their professions improve. I had a patient tell me the other day that the smile we made for him ten years ago probably added an additional million dollars in sales for his career. I joked with him and told him I apparently didn’t charge him enough. But in a different perspective I feel I did get paid an additional amount. It turned out to be as my father would now call it: “The Third Pay”. Dr. Marc Montgomery received his DDS from the University Of Minnesota School Of Dentistry in 1986. 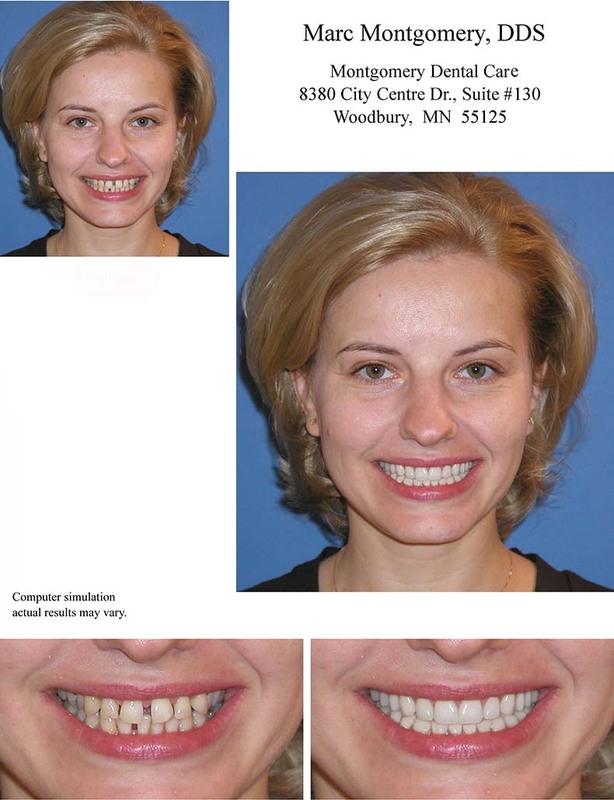 For the last 26 years he has focused on high-quality, cosmetic-oriented family dental care in Woodbury, MN. He has been named Minneapolis/St. Paul Magazine’s Top Family and Cosmetic Dentist six consecutive times (2000, 2002,2005,2007,2009 and 2011). He is an accredited member of the American Academy of Cosmetic Dentistry, member of several dental organizations and past president and current board member of the Minnesota Academy of Cosmetic Dentistry. NOTE: This article, Predictably Meeting Patient’s Expectations in Esthetic Dentistry, was published at Oral Health Group on April 1, 2012 and is optimized by Hill Web Marketing.